Our Vault line of enclosed trailers is designed with quality materials for years of trouble-free service. 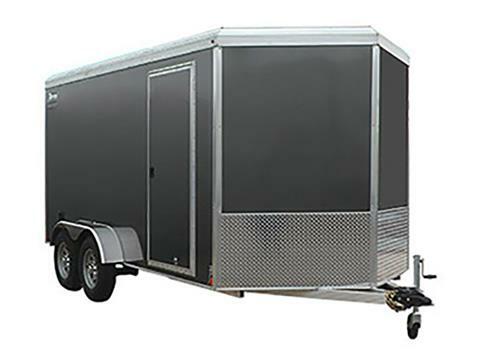 With features like a ramp approach angle engineered into the door, and ?” plywood walls, you receive the easiest-to-use snowmobile trailer experience. Take a look at some additional features below, and be sure to request a quote from your dealer when you find the model you’re looking for. 16 in. on-center walls, ceiling and cross members. 24 in. tall aluminum diamond plate stone guard. Interior LED dome light with wall switch (6 & 7 ft. wide); two interior LED dome lights with wall switch (8 ft. wide). Treated 3/4 in. plywood decking with limited lifetime warranty. Heavy duty 1200 lb. swivel wheel tongue jack. Your choice of spring lift assisted ramp door or swing doors. Four flush mount D-ring tie downs (6 & 7 ft. wide); six flush mount D-ring tie downs (8 ft. wide). 3/8 in. plywood walls fitted into our custom designed cove extrusion. With Brakes - 5,095 lb. With Brakes - 7,000 lb. Rear - 66 in. up to 78 in.